Wonsupona is a strategic brand storytelling consultancy that crafts brilliant messages, names and strategies that spark resonance and delight. Reve Body Sculpting is the nation’s hottest and healthiest way to sculpt your dream body. Reve already had a unique and inspiring offer, but desired to tell an aspirational story through their messaging to engage customers. We started with a competitor audit to learn opportunities for differentiation. 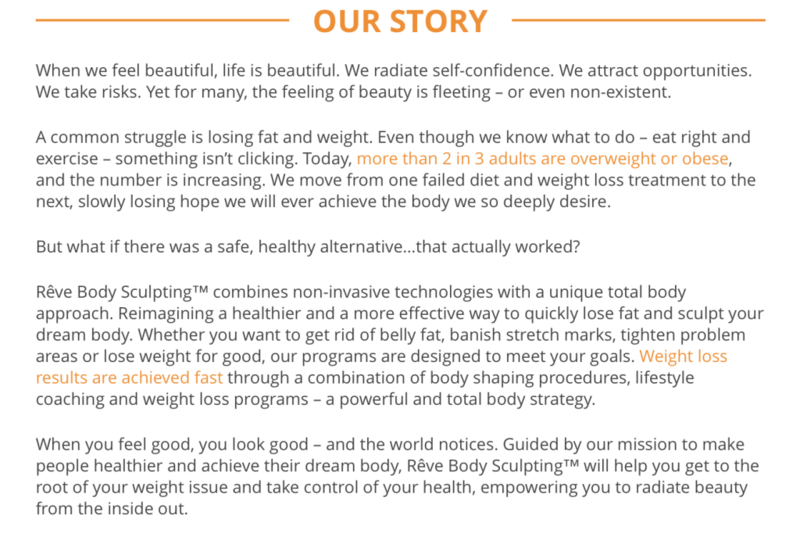 As it turns out, many weight loss studios are nearly indentical in terms of messaging and photography. Most of us are inundated with “Lose weight fast!” ads every day. A distinct voice and tone was needed to tell Reve’s story in a way that inspired customers to feel their best, whatever stage of their weightloss journey. Website messages are centered on communicating Reve’s unique total body approach, the brand’s main differentiator. A conversational tone was used to inspire trust and write about weightloss in a way that is empathetic and relatable. Dreams are also a key theme throughout the website (Reve means dream in French.) Website photos are of real people – not models – to further reinforce the brand’s approachable nature, and wherever possible clients help tell Reve’s story through their own successful experiences. To view the entire website, please visit http://www.revebodysculpting.com.